Romantic sunsets, beautiful beaches, the pure blue sea colour and other hidden beauties make Greece and its islands a paradise to be discovered. That is why Greece is one of the world’s most unforgettable wedding destinations! Our company prides itself on organizing weddings in Greece in any location you wish! There are plenty of options regarding your destination and over 100 islands in Greece to choose the perfect location for you! 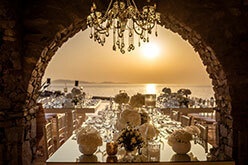 Apart from Mykonos we also organize weddings on the beautiful islands of Santorini, Paros, Sifnos, Naxos, Chios, Rhodes, Crete, Skopelos, Skiathos. Also there are other exquisite cosmopolitan mainland locations and in the Greek countryside like the medieval castle of Monemvasia, the rocky scenery of Mani and the beautiful Grand Resort of Costa Navarino with excellent facilities in Peloponnese. However, our services are not limited to those locations! We are more than challenged to host a wedding in more boarder islands or countryside which are still pure and untouched like Koufonisia, Astypalaia, Anafi etc. Most couples are choosing the Greek island for a destination wedding due to the indescribably beautiful scenery: gorgeous crimson sunsets and whitewashed houses perched above the deep blue Aegean Sea create the most romantic environment imaginable. Greece offers an almost limitless number of choices ranging from less-frequented spots to more polished environments, depending on your tastes. It is an understatement to say that they are all out of this world! Each Greek wedding package is a joint cooperation between us and you. We are committed to design a wedding that reflects your personalities and fulfills the dream of how you wish to spend one of the most important days of your lives! Our goal is to fulfill your wishes and make your destination wedding concept come true! Have a wonderful wedding in Greece!!! !